In support of National Engineers’ WeekTemple Libraries hosted several events at Paley Library. In addition to a 3D printing demonstration, engineering students hosted a maker event for non-engineers on February 24 and 27, 2015. The project had students making a digital LED die. It is a kit that is created specifically for maker events to expose people who have little experience with making anything to the challenge of building a small electronic device. It’s a great way for people to discover they have the ability to build things with their hands.
. With soldering irons in hand, five students – with little making experience among them – built their die under the watchful guidance of the engineering students (Tori Slack, Qianguo Ren and Stephanie Bui). 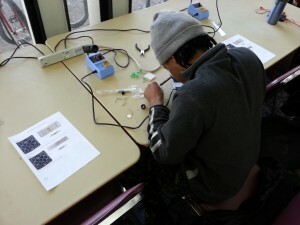 The Libraries provided the kits, while the engineering students brought the soldering irons, tools and their expertise. Making events are growing in popularity at college libraries as students are taking more interest in getting experiences where they use their hands to put something together. When the Digital Scholarship Center opens up at Paley Library in the fall of 2015 the Libraries will sponsor more maker events. If you are interested in learning more about maker events contact Steven Bell, Associate University Librarian. This entry was posted in Library Events and tagged engineers week, maker event, Top News by Steven Bell. Bookmark the permalink.